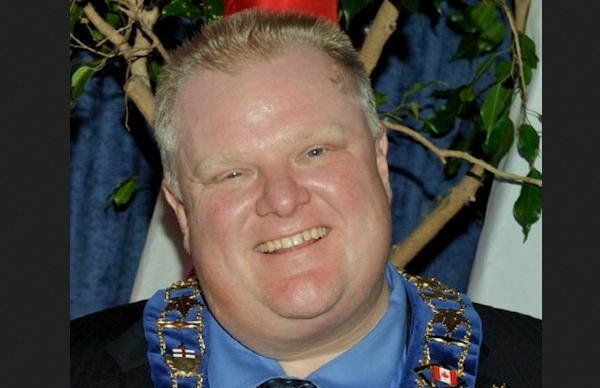 If you are unfamiliar with Rob Ford, he is the current mayor of Toronto and has been since 2010. During his three year stint at the top of one of Canada’s largest cities, it has become very obvious that Rob Ford loves to drink and he does so well within the view of the public eye while even admitting to driving drunk. He has also openly admitted to smoking crack cocaine even though he has threatened to sue several people who reportedly have seen him do cocaine in person. He has also been accused of making inappropriate sexual comments to female staffers and bringing prostitutes to huge booze bashes in his government office. In short, this guy makes Marion Barry look like a pretty good role model but somehow – there are still those citizens in Toronto who support him. They might be a bunch of drunken, crack addicted hookers but they are citizens who deserve their right to support whomever they please. Unfortunately, a group of those supporters arrived at a Toronto area United Way event wearing Ford Motor Company shirts that read “Ford Nation” with the familiar Blue Oval logo. Obviously, if you support someone named “Ford”, a Ford Motor Company shirt seems like a nice off-the-shelf way to show that support but considering the constant controversy surrounding the booze-swilling mayor, FoMoCo has moved to make it very clear that they – as a company – do not support Rob Ford nor do they approve of the use of their logo by his supporters. "Ford did not grant permission for use of its logo. We view it as an unauthorized use of our trademark and have asked it to be stopped," said Ford Motor Company spokesperson Jay Cooney. Additionally, Ford Canada posted on Twitter that “Ford Motor Company did not grant permission for the use of its logo and thank you for bringing this to our attention.” Based on that, it sounds as though those who oppose Rob Ford and his actions while serving as the Mayor of Toronto alerted Ford Motor Company to the fact that Rob Ford fans were showing their support with Ford brand shirts so the American automaker has made it very clear that they don’t like how their logos are being used. Realistically, there doesn’t seem to be much that Ford Motor Company can do to prevent Rob Ford supporters from wearing Ford brand shirts. It would be one thing if a company was making Rob Ford shirts with the FoMoCo logo but that doesn’t seem to be the case and without Ford brand shirts sold all over the place, there is no real way to prevent a Rob Ford supporter from wearing a Ford shirt when exercising their enthusiasm for the hard partying mayor.